Feeling a little stressed lately? Some shots just happen; you are in the right place at the right time. Though the reality is that for most of us these shots seem to be few and far between. Sometimes you just can’t afford to “wait for the light”. Other times, you can plan all you want, but then mother nature likes to crash the party. Another way to create some magic is to plan a shoot out ahead of time and see what you can come up with. These images rarely end up exactly as you envisioned, and in fact can take on a life of their own, but somehow they are more gratifying in that you have put some thought into it and have made a concerted effort to create something special. Somewhere I got an idea to put a fish in a blender and take a picture of it, After blender shopping at Costco I was off to the Pet store to pick up my unsuspecting model. I scoured the tanks looking for a connection but no fish would make eye contact. Actually, it was pretty hard to find a fish that wasn’t missing parts of it’s tail or had some huge growth obscuring it’s vision. Finally I saw him, he wasn’t afraid like the other fish, he was trusting, little did he know the fate that awaited him. I took him home and put him in his new tank, the one I got from Costco. Muoohahaha! He seemed to like his new surroundings, oblivious to the fact that right below, the razor sharp blades threatened to make sushi of him. He did looked stressed though. I could identify with the little fellow, as we all sometimes feel that we have lost control of our lives. I took an afternoon photographing him in my studio as he swam around. Ironically, he seemed to like swimming near the blades, taunting them to “bring it on”. 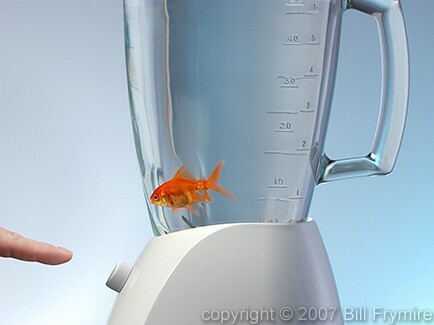 I never did plug the blender in … I would never forgive myself if it accidentally got turned on. The original switch position was too low and out of frame so later in the computer I replaced the switch with a button I drew in a vector program which was more visually effective with the finger poised to press it. I loved the tension that the image creates and Goldie stepped up to deliver a stellar modeling performance, no digital retouching was required to get his sad eyes and stressed out demeanor. I actually played with Photoshop and tried to emphasis the sadness but Goldie nailed it on every shot. He didn’t let me down. What I didn’t count on was the subsequent adoption of the fish by our family, I guess I didn’t think it that far ahead. My young kids were horrified by his living conditions, put him in a proper tank and promptly named him the most original name they could think of … Goldie. It’s bad news when they name them, because now you can’t eat them; that’s the first law of pets. So now we have Goldie the goldfish as a part of our family. At least we did for 2 years until our cat ate him, I guess she never heard about the first law of pets. The funeral and subsequent back-yard burial service was a tear wrenching experience with my eldest boy giving the eulogy. “He was a good fish” pretty well summed it up. Goldie will remain in our hearts and live on in his pictures, after giving a performance his other feeder fish friends would be proud of. Premium post, great looking blog, added it to my favorites! !